So we all associate spices with Autumn, right? 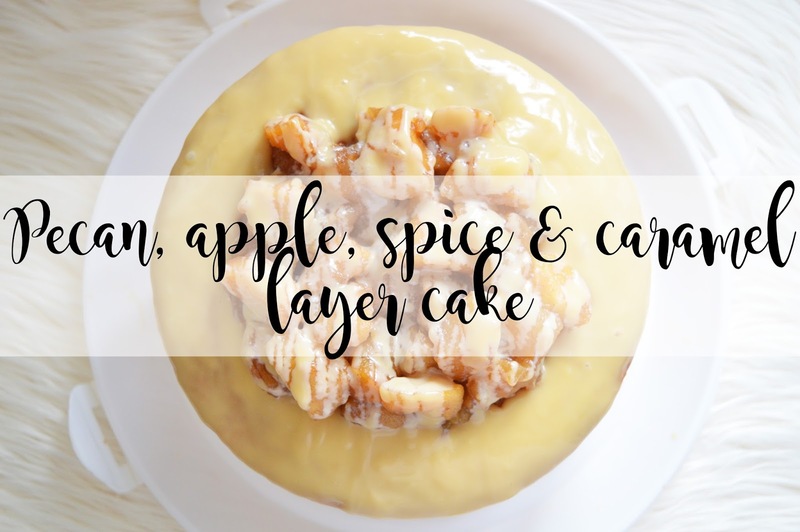 So what's better than creating a three layer cake with pecan, apple, spices and caramel; everything you need in a cake in the colder months! I love this cake so much as it's not too sickly due to having the sides of the cake open with no frosting on the sides. It's a light and airy cake with the right amount of spice too! (Not too over powering). This cake is so much nicer when the apples are fresh, however you can do what I did and freeze the apples and then cook them which means you can prep the apples whenever you have time too! Prepare three 7.5 inch cake pans with parchment paper circles in the bottom. Preheat oven to180°C. Now add the egg whites in two batches, mixing until well combined after each. Do not forget to scrape down the sides! Combine dry ingredients in a separate bowl, then combine the apple butter and milk in a small measuring cup. Add half of the dry ingredients to the batter and mix until well combined. Add the apple butter mixture and mix until well combined. Lastly add the rest of the dry ingredients and mix until well combined. Pour evenly into the cake tins and bake in the oven for 25 minutes or until a skewer comes out clean. In a large saucepan add the sugar and water. Turn on a medium heat, bring to the boil. This will gradullay change colour from clear to pale amber then to a dark caramel. Remove from heat and stir in the cream. Add the butter and vanilla extract. When this is cool enough, place in the fridge to thicken. Mix the milk and icing sugar together until thick and creamy. Add 16tbsps of your caramel into this mixture and carry on mixing until combined. If this doesn't have enough caramel flavour for you, add more and carry on mixing! To make the cinnamon apples, add everything to a large pan, mix these and cook over medium heat until apples are soft and browning. When the cakes are cool, place the first layer of cake on cake stand or a plate. Cover this layer of cake with some of the frosting and smooth so it is even! Add the second layer of cake on top and add remaining frosting. Ensure this layer of frosting is also evenly spread across the cake. Pile your spiced apples onto the top of the cake. Use a spoon to drizzle the caramel sauce down the sides of the cake. Drizzle the rest of the caramel sauce over the top of the cake and then over the apples. At this stage you can add some chopped pecans on top if you would like too. Keep refrigerated as this cake includes cream and milk! Let me know if you make this cake and what your thoughts are on it! This cake looks incredible! It's making me so hungry. Great post!